This decree means that any property belonging to Dugin that is within reach of the Soyuz (aka the country formerly known as the United States of America) is subject to forfeiture, and US citizens who do business with the professor will face criminal prosecution under the Trading with the Enemy Act. What did Dugin – a so-called “mad professor” who will inevitably be portrayed on film by Russell Crowe -- do that merits this designation? He holds no government position, nor is he the chieftain of a private criminal syndicate. 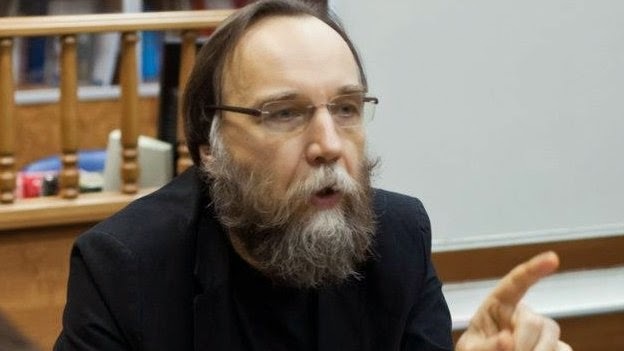 Dugin, an outspoken Russian nationalist, has been depicted as a species of terrorist – the intellectual leader of a “revisionist” movement in Russia. It is his use of the written and spoken word that provoked the outrage of the Trotskyites controlling Washington’s war-making apparatus. Dugin’s heretical rejection of Washington’s imperial rule-set made him “one of the most dangerous people on the planet,” according to noted geostrategic analyst Glenn Beck. 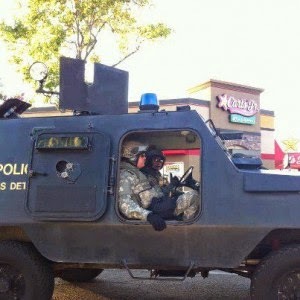 ... what it really looks like (Anaheim, 2012). In other words, Dugin – a citizen of a country with which the United States is not formally at war – was targeted for economic punishment as a thought criminal. He should consider himself fortunate that he hasn’t yet been targeted for a drone strike. 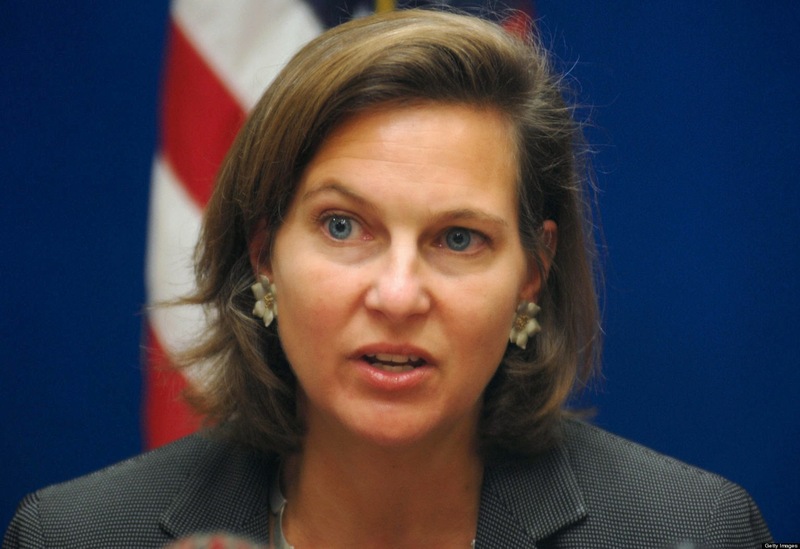 If that were the objective, Assistant Secretary of State Victoria Nuland’s name would be at the top of the index of proscribed persons. A little more than a year ago, some might recall, Nuland was caught in the act of plotting to unseat Ukraine’s elected president and install a junta that would take dictation from Washington and the IMF. It appears that those in charge of the Regime, like their Soviet forebears, employ “Aesopian language” in their public pronouncements about foreign policy, much as Soviet ruler Leonid Brezhnev did in the September 1968 address outlining the doctrine that bore his name. On this principle, Brezhnev insisted, the August 1968 Soviet-led invasion of Czechoslovakia, in which hundreds were killed and a reformist government was destroyed, was not a violation of that country’s “socialist sovereignty,” but rather an enhancement thereof. The ruling elite in Washington and the EU see developments in Ukraine in the same light. The coup that ousted the country’s elected president, Viktor Yanukovych, was a responsible exercise in “internationalism”; the plebiscite that led to Crimean secession, by way of contrast, was an offense against the “world revolutionary movement” that must be punished through mass bloodshed. Rear Admiral John Kirby was given the unpalatable task of defending Hagel’s statement when asked about it by AP reporter Matt Lee. “Is it not logical to look at this and say – the reason why Russia’s army is at NATO’s doorstep is because NATO has expanded, rather than Russia expanding?” a composed and visibly disgusted Lee asked of Kirby, whose twitchiness and flop sweat summoned inevitable comparisons to Nathan Thurm, the pathologically dishonest lawyer played by Martin Short. “I think that’s the way President Putin probably looks at it – it is certainly not the way we look at it,” oozed Kirby by way of a non-reply. “You don’t think that NATO has expanded eastward towards Russia?” Lee wearily persisted. “NATO has expanded,” Kirby grudgingly admitted, before trying to deflect the conversation toward Russia’s supposed transgressions. “It wasn’t NATO that was ordering tons of tactical battalions and army to the Ukraine border,” Kirby declared. ...Kirby's Spirit Animal, Nathan Thurm. Kirby began his exercise in baroque double-speak saying that Russia’s “intentions and motives” displayed an effort to call back “the glory days of the Soviet Union.” He ended by accusing Russia of aggression by moving troops within its own borders in response to US-abetted violence within a neighboring country. There is nothing novel about Soviet-grade semantic engineering of this kind by a Pentagon spokesliar. In a November 2005 press conference, Donald Rumsfeld, who at the time was Chief Commissar for Aggression and Occupation -- or, as the position is more commonly known, Secretary of Defense – described what he called an “epiphany” regarding the resistance to the Regime’s humanitarian errand in Iraq. This, too, was a familiar theme in Brezhnev-era official cant: Once the forces of “progress” have taken control of a country, all resistance is “counter-revolutionary,” because nobody could have a legitimate grievance. How, then, were the Iraqi guerillas to be described, since the term “insurgents” was forbidden? Shortly before leaving for a scandal-abbreviated term as head of the World Bank, Rumsfeld’s deputy Paul Wolfowitz employed the orthodox Marxist expression “forces of reaction” to describe those ungrateful Iraqis who had taken up arms against the radiant forces of democratic liberation. Language of this kind has a familiar odor to Russian nationalists like Dugin, who displays no nostalgia for the Soviet Union into which he was born in 1962. 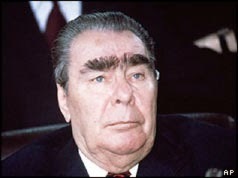 Brezhnev without the unibrow: Nuland. Unfortunately, Dugin continues, the American political elite have their own version of the Brezhnev Doctrine under which respect for “diversity” is limited by the “international obligations” imposed by the Empire. Ukraine, from Dugin’s perspective, is defined by a “multiplicity of identities,” the most important of which, to him, is Kiev’s role in the “genesis” of the Russian people. Eastern and western Ukraine, he contends, is historically and culturally part of “Greater Russia.” Contemporary Kiev and the western section of the country are more congenial to the West. Apart from the ideological demands (and crony capitalist interests) of Washington and the EU, there is no reason why Ukraine cannot peacefully devolve into two or more political entities. The alternative is continuing, and escalating, the US-abetted civil war that increasingly appears to be a preliminary round in what could become a direct military conflict between Washington and Moscow. Sober and responsible people might find elements of Dugin’s worldview – and some of his past associations -- troubling or even repellent while finding his prognosis of current affairs to be sound and compelling. One need not endorse what Dugin would like to build in his own country in order to appreciate the truths he tells about the people who are orchestrating a war that could destroy both our country and his. And the means used to criminalize Dugin for giving voice to impermissible thoughts is irrefutable proof that Washington, not Moscow, is home to the true heirs of Lenin’s totalitarian vision. Click here to listen to or download the most recent Freedom Zealot Podcast. Your help is urgently needed to keep Pro Libertate online. Thank you so much! My neighbor forcibly evicted and killed by the police! I notice that the Realtor was working on behalf of Fannie Mae, which is, for all intents and purposes, the federal housing soviet. Cap'n, I was thinking along very similar lines as I wrote the essay. Dugin is about my age, and I've never met (or corresponded with) a Russian of that vintage who has anything but contempt for Communism, or any desire to start a war with America. While there is much in Dugin's philosophy I don't like (nationalism and absolutism of any variety don't appeal to me as an individualist), he's not a diabolical proponent of continental or world conquest. That's Washington's gig, not Moscow's. this particular jewel of lying doublespeak can only be uttered where those listening are incredibly naive, overtly stupid, voluntarily misinformed or bought-and-paid-for. when will we sanction those who have done all that has been done to us? I no longer have an email address to correspond with you, so please forgive me lurching into this thread. You need to take a look at this. In the meantime, it was very good to visit with you again briefly a week or so ago. "How, then, were the Iraqi guerillas to be described, since the term “insurgents” was forbidden?" They have stretched and abused the word "terrorist" to mean anyone who fights without government permission. By their definition the Resistance in France and the Partisans in Eastern Europe were terrorists. I haven't quite figured out how attacking military units is cowardly and an act of terrorism, but being a sniper is brave and worthy of praise. I also haven't figured out how burning a man alive in a cage is wrong, but dropping napalm or white phosphorus on people is a sound military tactic. How is using an IED cowardly and terrorism, but using cluster bombs, artillery,mines and missiles from drones not? Maybe it would make sense if I was a hypocrite. But then I remember, Jesus seemed to save his worst for when he was talking to hypocrites. Great work (as usual) Will!